Scientists, in collaboration with researchers at the universities of Southampton and Calgary, used finger ratios from fossilised skeletal remains of early apes and extinct hominins, as indicators of the levels of exposure species had to prenatal androgens – a group of hormones that is important in the development of masculine characteristics such as aggression and promiscuity. Emma Nelson, from the University of Liverpool's School of Archaeology, Classics and Egyptology, explains: "It is believed that prenatal androgens affect the genes responsible for the development of fingers, toes and the reproductive system. We have recently shown that promiscuous primate species have low index to ring finger ratios, while monogamous species have high ratios. We used this information to estimate the social behaviour of extinct apes and hominins. Although the fossil record is limited for this period, and more fossils are needed to confirm our findings, this method could prove to be an exciting new way of understanding how our social behaviour has evolved." Dr Susanne Shultz, from the Institute of Cognitive and Evolutionary Anthropology at the University of Oxford said: "Social behaviours are notoriously difficult to identify in the fossil record. 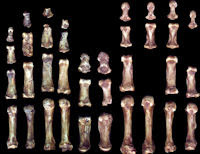 Developing novel approaches, such as finger ratios, can help inform the current debate surrounding the social systems of the earliest human ancestors."